The Wadi Sura – or ‘Valley of the Pictures’ – was the name given in 1933 by desert explorer László Almásy to an area at the foot of the sandstone cliffs of the Gilf Kebir Plateau, close to the border with Libya, where he discovered the famous ‘Cave of the Swimmers’. Seventy years later, a second painted rock shelter was discovered by Italian businessman Massimo Foggini and his son, containing over eight thousand figures; the numerous images of a particular hybrid creature inspired the name ‘Cave of Beasts’. The cave is now one of the most important prehistoric sites in Africa and this volume is the first of three to capture the beautiful rock art, using high resolution digital photography and 3D laser scanning (to correct for the irregular rock surface), presenting the paintings half their natural size and in full colour. There are thirteen articles (with many colour photographs and illustrations) dealing with the context of the pictures and their archaeological setting; these include paints and pigments used, conservation, “Visitors and Vandals” (the impact of desert tourism) and dating of the paintings based on the correlation with pottery sherds which places the prehistoric Wadi Sura artists at around 6500- 4000 calBC (calibrated by radio carbon dating). 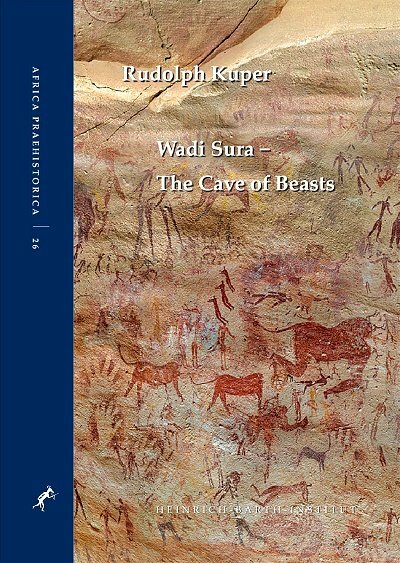 However, the primary focus of the book and of the Wadi Sura Project (a University of Cologne /German Archaeological Institute in Cairo joint archaeological mission) is to document systematically the shelter and its rock art. This includes human figures full of life and vitality, shown dancing, hunting, fighting and taking part in rituals and domestic activities. The immense size of the book itself (you will need a very strong coffee table!) allows you to enjoy a detailed close-up view of each painted figure or scene, with a section concentrating on engraved (as opposed to painted) figures, and two selected paintings presented as posters, together with a transparent grid sheet, in a pocket inside the back cover. 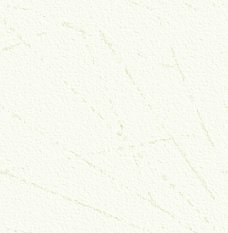 It is a beautifully presented work that makes these paintings accessible for those interested in their serious scientific study, but also for anyone who wishes to admire their extraordinary artistry, and gives us a glimpse of the daily life and spirituality of an unknown culture that existed eight thousand years ago. I had the pleasure of travelling with Francis Lankester on what was probably my first trip to the Eastern Desert in February 2008. 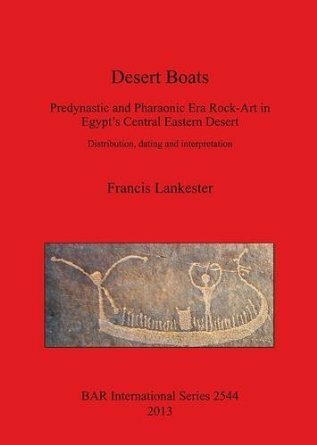 This BAR publication is an abridged version of Lankester’s Durham University thesis on the Eastern Desert rock-art and is of great value to ‘desert-hounds’ like myself as it brings together data from a number of studies, including the early work of Hans Winkler, the ‘RATS’ expedition led by Dr. Toby Wilkinson and the Eastern Desert Survey, led by David Rohl, as well as other areas of Egypt, including the Theban Desert Road Survey and excavations at Hierakonpolis The stated objectives are to investigate the distribution of the rock-art, to date the petroglyphs and to consider what their purpose may have been. After discussing the adopted methodology and the setting provided by the landscape and geology, the work presents a detailed assessment of a number of different classes of rock-art, dividing the corpus into depictions of animals, people, and boats each broken down into a series of sub-classes (i.e. different animal types, human figures with different postures and different forms of boats). Detailed statistical assessment is used throughout in support of the classifications and interpretations that are presented. Lankester then presents an assessment of distribution within the study area and, using comparisons with other forms (ceramics, tomb paintings etc), discusses the likely dates for the different sub-classes. Interestingly, he is quick to dismiss patination as an aid to dating, stating that except for a number of very limited cases, the depth of colour of rock-art cannot be used as a guide for reliable dating. I wholeheartedly agree. The assessment of distribution identified a number of regional variations allowing the study area to be divided into northern, central and southern regions and in some cases, identifying variations in distribution between adjacent but interconnected wadi systems. I found this to be a particularly interesting part of the study. Lankester then considers the work of other researchers into the purpose or meaning of the Predynastic rockart and presents his own theories on what the rock-art may have meant to those that created the petroglyphs, concluding that different elements of the corpus are the result of different activities with this semi-arid landscape. There is a well-known saying: “From a tiny acorn, the mighty oak tree grows”. In Bob Brier’s case, his childhood passion for collecting acorns led to a mania for collecting all things Egyptian, beginning with a collection of books, but quickly expanding to prints, posters, teapots, Cleopatra soap and even a “Barbie of the Nile” (wish I had one of those!). So although a bona fide Egyptologist, he also understands the powerful lure of Egypt outside of academia. After an amusing introduction from Zahi Hawass (recounting some of his more bizarre experiences of meeting Egyptomaniacs! ), Brier begins with his own collection, and asks why Ancient Egypt is so fascinating to so many people: “the hieroglyphs seem undecipherable, the pyramids appear unbuildable, the art is unsurpassable, it’s thousands of years old and it’s still there”. Of course mummies play a large part in the attraction, which is why children will rush straight to the Egyptian section of a museum, rather than go to admire a Greek vase. We are then taken back to the “Birth of Egyptomania”, with the writings of Herodotus and the Roman passion for Egyptian style and culture following Cleopatra’s ‘conquest’ of Caesar and Hadrian’s grand tour of the Nile. 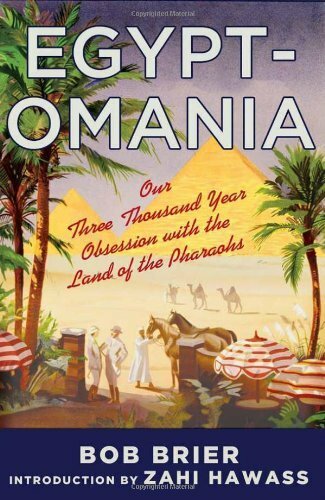 Further chapters explore the influence of Napoleon’s expedition, the dispersion of obelisks and the digging of the Suez Canal, as well as the mania for mummy-related songs (see page 10), mummy movies and ‘Tutankhamen Superstar’. A selection of Egypt collectables are presented in black and white photographs, including cigarette tins, homeware, mummy bracelet charms and song sheets, together with a detailed bibliography. Brier ends with a look at the Egyptomania of the future; with major discoveries (such as the tombs of Cleopatra, Alexander and the pyramid- building Imhotep) still to be made there will undoubtedly be large queues for exhibitions and lavish spending on Egyptianising souvenirs for generations to come. This hardback, with its eye-catching cover and intriguing subtitle, will surely attract many readers looking for answers to some of the fundamental questions we have about ancient Egypt. The writer’s credentials are impeccable and with a format that poses “101 questions and answers”, the publishers would appear to have hit upon a winning formula. Regrettably, the subtitle does give a clue to the type of answers provided in that they are ‘intriguing’, by no means straightforward, and generally do not actually answer the question at all. Rather the author clearly shows his extensive knowledge and scholarship on the subject by presenting a vast amount of background information and scholarly debate without committing to a final answer. This leaves it to the reader to sort through the facts and opinions to reach their own conclusion; intriguing indeed. As an example, question 100 asks “Who is the most famous Egyptologist?”. One would expect an answer mentioning either Howard Carter (who of course discovered the Tomb of Tutankhamun) or perhaps Zahi Hawass (famous for his TV appearances). Instead the author discusses Daniel Jackson, a fictional Egyptologist who appears in the Science Fiction film/TV series Stargate and then goes on to mention other fictional Egyptologists found in films and children’s book dating back as far as the 1930’s. Howard Carter does eventually get his name mentioned in passing, near the end of the author’s discussion – but it seems as if the author went off at a tangent somehow, and totally fails to mention any other real contenders for the title – Champollion for instance. Other more surprising questions include “Why is there a Pope in Rome and not a High Priest of Isis?”, “Why was there no pig deity in ancient Egypt?” and “What role does ancient Egypt play in the Mormon faith?”. 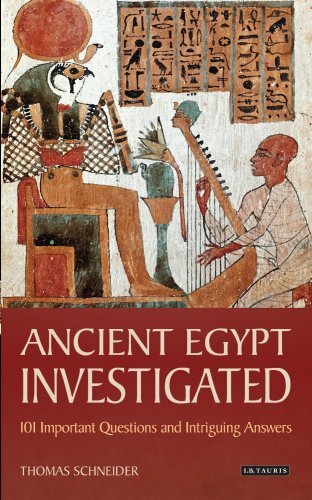 So, a thought-provoking study which, although it never really lives up to its promise, may make a good present for an ‘academic scholar’ in your family who wants to chew over some of the less conventional issues in Egyptology today. There is a 30% discount on this book for AE readers, using the code 9LQ online at www.ibtauris.com, by calling +44 (0)1256 302699 or emailing Direct@macmillan.co.uk. You can also win a copy in our special Christmas Edition competition on page 64 of the magazine. This is the first of two volumes making a collective study of the queens of the First to Sixth Dynasties, focusing on the historic position of the individual ‘queens’ including women holding the title of ‘King’s Mother’ as well as those called ‘King’s Wife’ and gathering together the results of a growing number of studies into the royal women of ancient Egypt. The book is divided into two sections, the first a register of queens in chronological order, beginning with Queen Neith-hotep of the First Dynasty (possibly the wife of Aha) through to Queen Neit-Ikrety (Nitocris, possibly the last ruler of the Sixth Dynasty), giving for each (where known) her name and any variations, the king(s) with whom she is associated, tomb details and titles, followed by a prosopography (an investigation into the lives of the queens and their relationship network – a collective biography – within the context of their specific historical group, a method often used where little is known about particular individuals within that group). The author’s aim is to provide a compendium of source material for further research, rather than presenting in-depth studies of each individual queen. Each entry is followed by its own bibliography, with an extensive general bibliography (and genealogies) at the end of the book. The second section gives a general historical perspective of the monuments, titles and iconography relating to the queen in the Old Kingdom, showing a dramatic increase in status between the First and Sixth Dynasties (as seen in the increasing size and complexity of the tombs, leading to the use of pyramids) and the royal mother and royal wife increasingly being modelled on the image of Hathor. 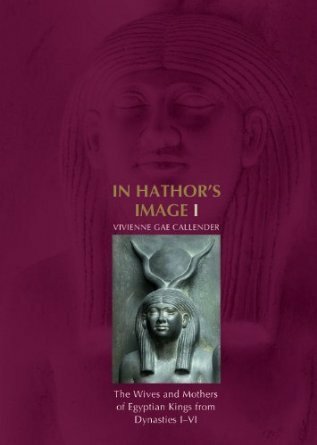 This section is presented as an interim summary ahead of the more detailed exploration due in Volume II, which will draw together the results of a growing body of research into the royal women of ancient Egypt. Ancient Egyptian is the oldest known language; recently discovered examples of hieroglyphic writing date back to c. 3250 BC. The language existed for five thousand years (to the last written forms in eighteenth century Coptic documents) but over this period evolved through a series of five historical stages, with significant differences in grammar between the earlier stages (Old and Middle Egyptian) and the later stages (Late Egyptian, Demotic and Coptic). However as the written script was deciphered only in the last two hundred years, our understanding of both written and spoken Ancient Egyptian is still evolving, with various methods and theories coming in and out of vogue. In this work, James Allen presents the first study to trace the changes in ancient Egyptian phonology (the study of speech sounds) and grammar throughout the entire history of the language, including a new analysis of phonology (in place of previous methods that relied solely on a comparison of words from related Semitic languages such as Arabic and Hebrew). A short historical overview of the language’s written and spoken development is followed by a study of phonology, beginning with the various dialects of Coptic (attested as a living language for about fifteen hundred years) and working backwards to find evidence for these Coptic sounds in earlier phases of the language. Part two concentrates on grammar, which is studied both synchronically (the workings of the language at each of the five historical stages) and diachronically (historical evolution and the process underlying these changes). 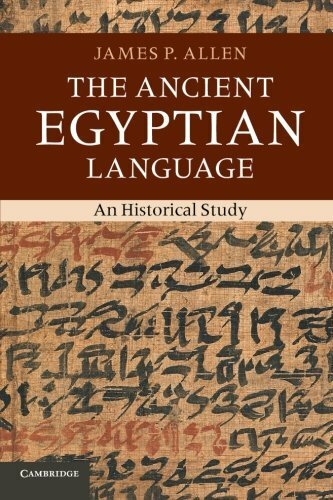 Complete with comprehensive notes, bibliography and indices, this book is essential reading for anyone studying the development of the ancient Egyptian language or who has a more general interest in linguistics and the history of language development. Nicola Harrington here gives an overview of the evidence for the religious practices and beliefs regarding death and the dead, focusing on the period from the Old to the New Kingdoms, using textual, iconographical and archaeological sources to analyse the interaction between the living and the dead. Beginning with the essential characteristics of the dead as distinct from the living, Harrington then investigates the mortuary cult and veneration of ancestors, with the associated rituals, statues, ancestor busts and stelae, before discussing when and where such interactions with the dead took place, and attitudes to the dead (including the impacts of tomb robbery, desecration, tomb reuse and the death and burial of children), backed up with many black-and-white and colour illustrations and a comprehensive bibliography. 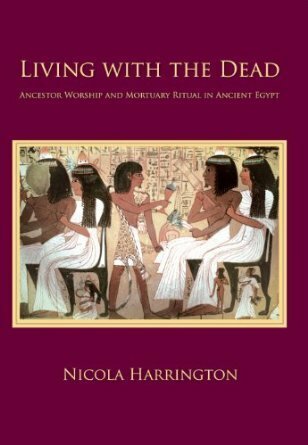 She concludes that the relationship between the living and the dead in New Kingdom Egypt was a complex one based on reciprocity, but where fear and a need to appease the malevolent dead may also have played an important role. The act of preparing for burial and arranging a mortuary cult may have been sufficient to secure a place in the afterlife.